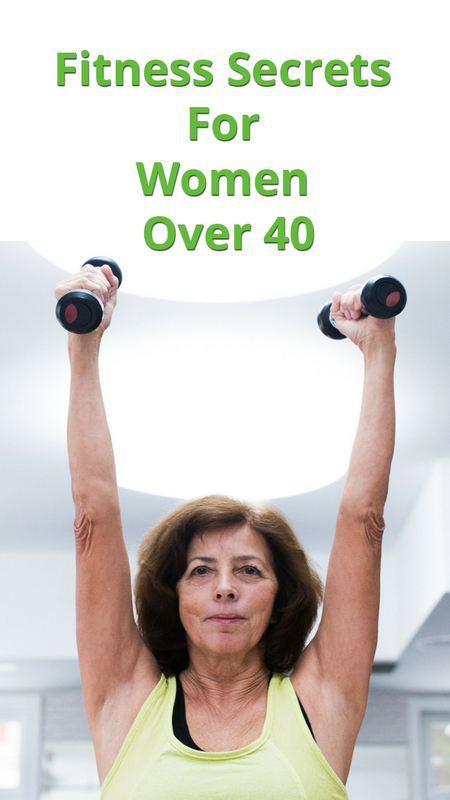 After 40 the body starts to slow down and muscle mass begins to decrease. Statistically, adults over the age of forty lose about 5% of muscle mass on each subsequent decade from life. Muscles are crucial in keeping bones strong and balanced. 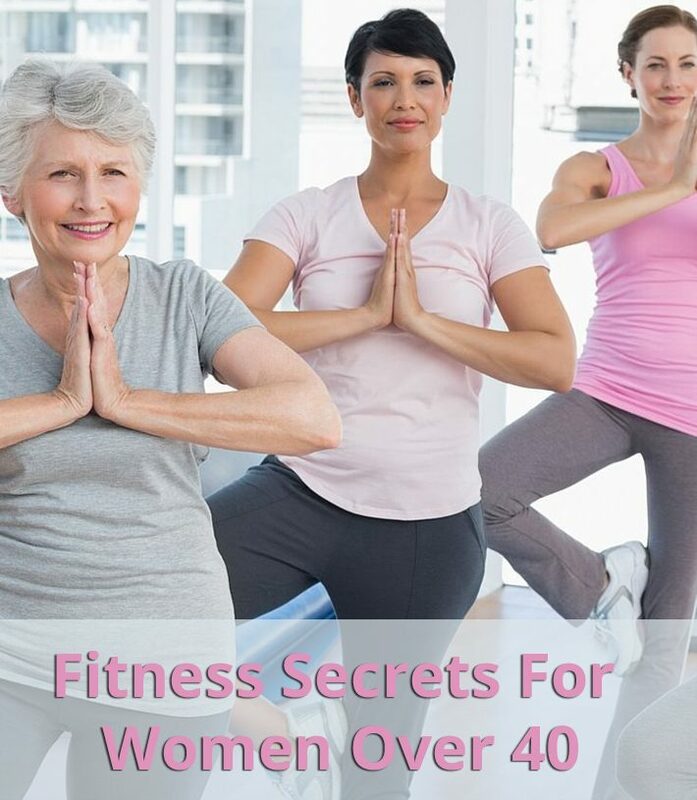 Fitness Secrets For Women Over 40. I find that many women in their forties experience weight gain around their middles, specifically; their tummies and behinds, resulting in a thicker waist and wider hips. Here are a few ‘SECRETS’ that you can employ to tap into the fountain of youth. I promise, you can feel better than you did in your thirties, look your best, and have energy to spare. GET RID OF YOUR TREADMILL! Yes, you read it right. If all you do on your treadmill (or any cardio machine) is long, slow, monotonous sessions, stop it! Sell yoursell your treadmill treadmill and make room in your house and life for some really effective fat burning exercise. And you don’t need to spend a lot of money! Your body is all you need. The key is that you must replace your long easy cardio sessions with short high intensity interval training sessions. This can be accomplished with a few simple body weight exercises such as the squat jump, jumping jack or stationary sprint. The following is a perfect example of how you can add a set of fat burning exercise to your day, sacrificing very little time and space. This is the SQUAT JUMP. (As you can see, you can modify this movement to your fitness level by reducing the height of the jump and the depth of the squat.) This is how you start your program. It’s simple! Start with 20 seconds of squat jumps, follow with a 10 second recovery time. Try to repeat this cycle for 5 minutes (or 10 total sets). Now you can rest for up to one minute. As your body adapts and your fitness level increases, add cycles until you can do another 5 minutes. You will burn a ton of calories in 10 minutes at this pace. Remember, this isn’t a slow, easy pace. You are trying to train at a high intensity level, so you should be breathing hard, and your heart rate should be up there. Modify by powerfully reaching to the ceiling without letting feet leave the ground. You can also adjust the depth of your squat. Going deeper hits your rear and thighs more effectively. Your GOAL is to add muscle to your body. Muscle is active, calorie burning tissue that helps keep your metabolism going women-gain-musclestrong. The reason why many women in this age group are gaining weight while eating the same quantity of food is that they’ve lost some lean muscle mass due to a more sedentary lifestyle. It’s a fallacy that our metabolism will slow down as we age, thus leading to that inevitable ‘middle age spread’ as we gain fat. By adding muscle building exercises 3-4 times a week, you will hold onto the muscle that you had in your twenties and thirties. In fact, if you work hard, you can even build a little extra. This doesn’t mean that you need to join a gym or buy expensive equipment. It also doesn’t mean you are going to gain muscle bulk, or look masculine, which is another fallacy. The female body simply isn’t capable of that unless you train very specifically with that goal in mind. Using your body weight as resistance is often more than enough weight, and you will achieve a beautifully feminine physique. WHICH BODY WEIGHT MOVEMENTS SHOULD I DO? One of the most effective body weight exercises is the unsung push-up. There is nothing new or glamorous about doing push-ups, but they work! You will work many of the muscles of the upper body, specifically the chest, shoulders and triceps. Many women complain that the backs of their arms are too flabby. Doing PUSH-UPS directly TARGETS those muscles. In addition, you will target the core muscles. The key is to keep your back plank straight through out. If body weight is too much resistance when you first begin, there are a variety of ways to modify the resistance. Anyone can do some sort of push up to increase upper body strength, add muscle and work the core all at once. WANT A TIGHT TUMMY? STOP DOING CRUNCHES! The mid section is always a trouble spot for women in their forties. There is no magic bullet for this area, but the PLANK is one of the most effective exercisesthat you can safely perform to tone the abdominals. 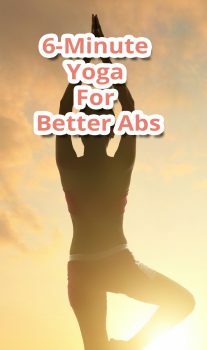 It effectively targets the abdominal area, and is much safer and easier to learn to perform than crunches. Having a strong core will reduce back aches and improve posture as well. You start by holding the position shown in the photo for as long as you can. If that is too difficult, start on your knees. As you get stronger, hold that position for longer periods. If you started on your knees, soon you will graduate to your toes. Before you know it, you will be sporting a stronger, flatter tummy! The first is, you cannot ‘out train poor nutritional choices’. What this means is, regardless of how hard you train, if your diet is poor, you simply will never get the results you are longing for. The exercises and strategies listed above are some of the most effective ways to tone your muscles. The fact is, you will never actually see those muscles, or improve your trouble spots unless you make sound nutritional choices. Secondly, going ‘on a diet’ is one of the most effective ways to GAIN weight! ’. Lowering your calories excessively will result in a slower metabolism. Eventually, this leads to more body fat, and for most women, a revolving cycle. This will make you unhappy, and unhealthy. Making sure that your diet is jammed with nutritionally dense whole foods will multiply the results you will get from any workout regime you decide to use. Eat 5-6 small meals daily. This ensures that you never get too hungry and overeat. As well, your body knows that there is a steady supply of food coming in. This will help boost your metabolism, which helps burn body fat. Include protein with every meal. This will help to stabilize blood sugar and help to control your appetite. Lower your intake of starchy carbs, and eat more fibrous carbs. Steer clear of refined sugar. Your mother was right. Eat your veggies! Eat breads and pastas in moderation. Never drink your calories. So stay away from soda pop, and choose whole fruit over fruit juice. Women in their forties shouldn’t look matronly and feel old. Don’t settle for old stereotypes. You can feel energized and fit doing simple exercises that you can do in the privacy of your own home. Heart pounding, challenging workouts will make remarkable differences to your trouble areas. Fitness and fat loss is not rocket science, but it does take some will power, and the willingness to invest a small amount of time.